After my trip from the Surin Project in Ban Tha Klang to Koh Chang, I’m not certain that I buy into the whole “it’s the journey not the destination” philosophy when actually traveling. On a map, the distance between these two locations is not that far. My mistake was in thinking that there would be an easy route to get between the two. Trusting Ocha’s directions, I boarded the Nakonchai Air bus around 9 PM in Surin. 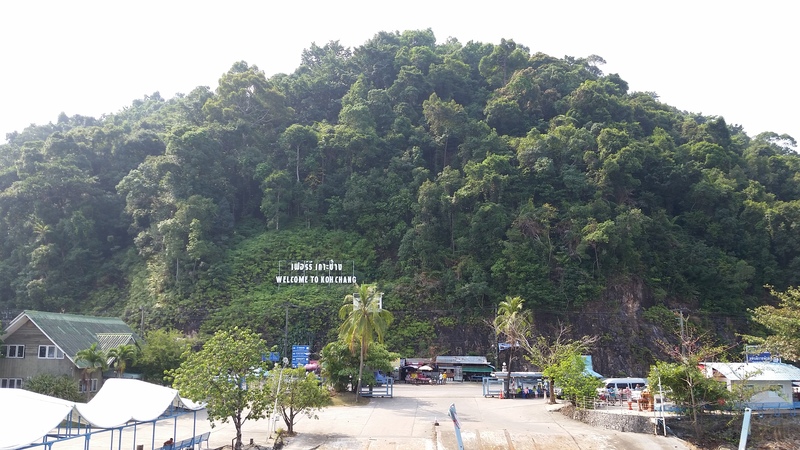 The plan was to take the bus to Rayong and from Rayong it would be easy to catch a bus to Koh Chang. At least that’s what he said. As we were sitting in the Surin Nakonchai Air bus terminal waiting for the bus, Ocha tells me to make sure that I get off the bus at the main Rayong Bus Terminal on the outskirts of town, not the separate Nakonchai Air terminal. Despite the comfort of my seat, I spent the next 8 hours in spurts of that trance-like sleep where you aren’t fully asleep but aren’t awake either. Having no concept of where the stop for Rayong was along the route factored heavily into that sleepless equation. Turns out, the bus doesn’t actually stop at the main bus terminal in Rayong. So at 5 AM, bleary eyed and confused, I finally ask a songtheaw driver to take me to the main bus station. The driver was not willing to bargain on the fare, insisting on charging me 150 baht (about $5). Based on where Ocha said the main bus station was relative to the Nakhonchai Air terminal, I figured was the price was high, but what is a couple of dollars when you are tired and confused. The driver took me to the terminal located inside the city about 10 blocks away. Upon arrival, I watched him laugh about the con he had just pulled on me. He watched me get my minivan ticket and continued to smirk smugly in my direction. Hopefully he felt the daggers that my look sent him. I also hope that my wish that his actions be returned to him ten-fold was fulfilled. Feeling hopeless and seeing that my only options were minivans to get to Koh Chang, I purchased my ticket for 200 baht and waited for the 6 AM minivan to leave for Koh Chang. Technically the minivan goes to Trat and from there I needed to take a ferry over to Koh Chang. By the time I got on the minivan, I discovered all the regular seats to be filled and had to settle for the very back, less padded seat. On the upside, for a good portion of the ride I was able to lay down on the seat and rest. After about an hour or two, I really can’t tell you how long it was in my sleep deprived state, my stop apparently came up. My stop turned out to be a small building at a corner on the outskirts of Trat. The driver took my suitcase up to the building for me, said something in Thai to whoever was supposed to be there, and off he went. As I stood alone in the building, I took some solace in the sign to buy a ferry ticket. After a short time, a man and two women arrived. The man said abruptly, “You wait for more people”. I said ok. Then after a few moments a minivan pulled up. Again the man said abruptly, “You buy ticket.” Quickly, I bought my ticket and got in the minivan. Without waiting for any more passengers, we were off for the 35 km drive to Leam Ngob where the ferry goes to Koh Chang. Arriving at the ferry, I was summarily dropped off. Looking disoriented and weary, a kind man pointed me through a door. I handed my ticket to the woman and wandered up to the ferry that was in dock. Being the only person that was on foot, I wasn’t sure if I should board or not. After a bit of hesitation, I walked up the car ramp and onto the ferry. After staking out a place where I had a great view, I purchased an ice coffee and took a deep breath. With careful orchestration, cars loaded onto the ferry. 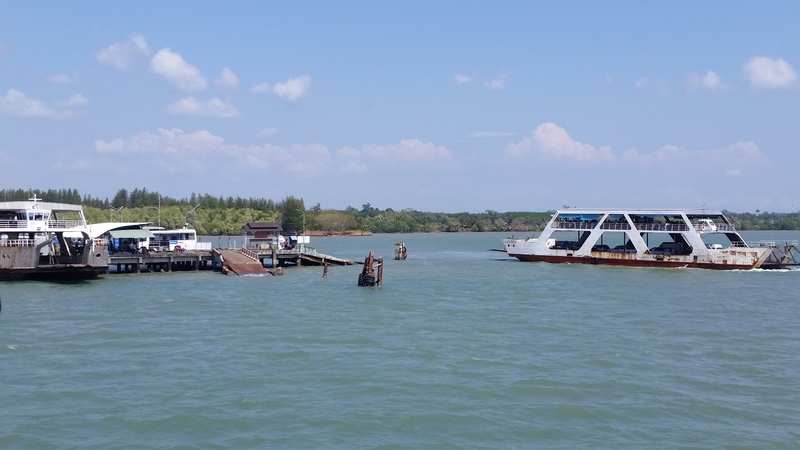 Eventually the ferry engines started churning and we departed for Koh Chang. Arriving on the island, the last hurdle was getting to my hotel. The white shared taxis at the meeting point insist on waiting until there are around 12 passengers to make the journey. Again, I was told to wait for more people. I joined another couple in waiting. Two more ferries arrived and still no more passengers. Finally, as though sensing my palpable desperation to get to my hotel, the drivers decided to make a deal with us to pay more than the normal fare instead of waiting. Initially, he said 200 baht. Less than 3 minutes later, while the other couple was debating the offer, the driver said 250 baht for me. Still stinging from the exchange with the driver in Rayong, I challenged him on the change in fare. Agreeing to 200 baht and the other couple agreeing to their offer, we loaded onto the taxi and finally were off. An arduous 16 hours after leaving Ban Tha Klang, I arrived bleary eyed and sleep deprived at my destination, Bailan Bay Resort. Koh Chang, translated as Elephant Island, is situated off the coast of Thailand, near the Cambodia border. The island is a lush green rainforest rising up out of the turquoise blue water of the Gulf of Thailand, looking like a herd of elephants loitering in a lake. Maybe it’s like finding shapes in clouds in that we see what we want to see. Elephants are not indigenous to Koh Chang. 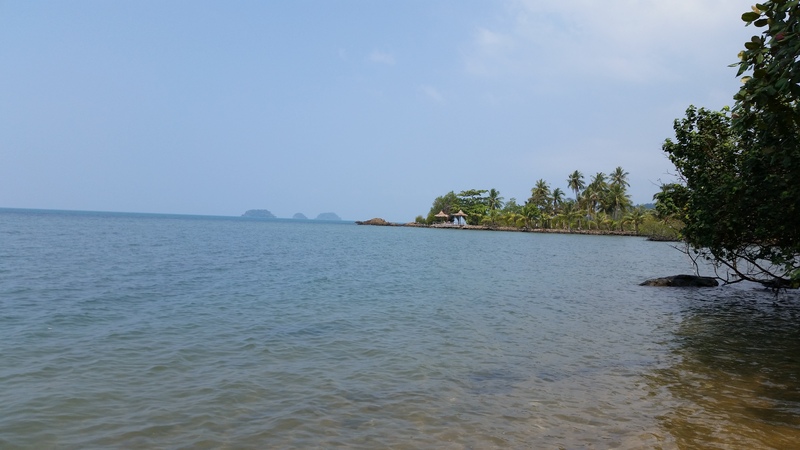 Koh Chang got its name from the elephant shape of the headland. The elephants that are here have been brought here to cater to the tourists, giving elephant rides and doing trekking. Sarot (the head mahout from the Surin project) has family that moved to Koh Chang to give rides in Ban Kwan Chang on the east side of the island. Never approving of elephant riding, Sarot opted to stay behind in Ban Tha Klang. Going past the elephant riding camps, my heart aches for the elephants and the families that are broken up in the name of the tourist baht. 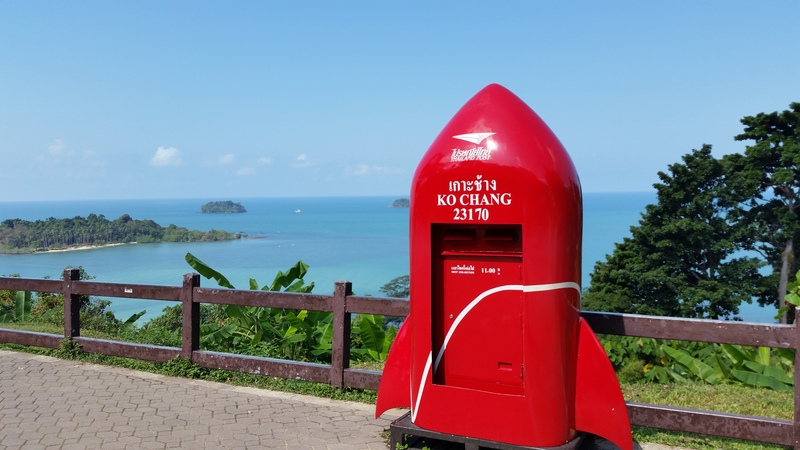 The second largest island in Thailand, Koh Chang is roughly 30 km long and 14 km wide, its highest point is 744 meters (2,440 feet). Most of the central part of the island is virgin rainforest, leaving the inhabited areas to the coast. Wanting to be further away from the main tourist areas, I chose Bailan Bay as my destination. Bailan Bay Resort is a quaint resort about halfway down the western side of the island. The individual bungalows cling to the hillside on the sharp 100 meter (328 feet) descent to the water. In a land of several resort hotels, Bailan Bay Resort is somewhere in between the fancy and the cheap. At the end of the path of uneven step-stones, tucked away behind a pair of mangrove trees and nestled into the hillside is bungalow #20. A sea-view room with a fan, it is about 20 feet from the water at high tide. The side of the bungalow facing the water is graced with two large windows and the small wood porch ensures an ample view of the bay. The bungalow is typical of most Thai bungalow architecture; a wood structure housing a single room with a thatched roof. The attached bathroom is almost like a concrete after thought. My bungalow is as far from the reception and restaurant as possible. To get to my bungalow I follow a cement walkway running parallel to the hill, then down a steep flight of 52 stairs with varying rise and run. The cement is textured like tree bark to as though to blend in with the natural surroundings. At night, the path to the room is illuminated by lanterns attached to poles. Where the lanterns have been broken, they are replaced by light bulbs protected by plastic bottles attached to trees. The lights lend an almost fairy tale like quality to the walk. What Bailan Bay Resort lacks in upscale amenities and maintenance, was made up for by its location. Taking the easy route of cutting around a mangrove tree, across the beach of the neighboring property, through the property up to the main road, and a short walk down the main road, I was at the small gathering of shops and restaurants that could be called Bailan Bay Village. I don’t think the village technically has a name. The best part was the distinct lack of tourist crowds found in the other coastal towns and beaches. Visiting Koh Change is like being in a postcard for a week. The verdant greens, the aqua and turquoise blue water, the clear skies. Mangroves dot the shore to help keep the island from eroding into the water. Vines drip from the trees as they reach toward the sky seeking the sun. The gentle waves of the Gulf of Thailand gently lap at the shore. Stump tailed macaques playing in the trees adding their chatter to the sounds of geckos chirping. Every day I made it a point to take a swim in the bath-like clear blue water. Even on the day that it rained, only the top couple of inches of water were cold, the lower layer feeling as though it was still being warmed by some geothermal source. Among the rocks lining the bottom of the bay, I saw many fishes darting for cover as I passed by. Though not as vibrant as some areas that I have had the opportunity to snorkel, I got to see quite a variety of yellow and black, all black, blue, brown, big and little fishes. Black eels lay on the bottom like large cucumbers. As the water became deeper, I swam through fields of sea weed. The tree-like plants ebbing and flowing in the tide, giving the water a yellowish cast. Eventually the water became deep enough that I could no longer see the rocks, despite how clear the water was. The changing tides were evident in the bay. At high tide, the water covered the many rocks and most of the beach. At mid-tide swimming became a bit of a challenge weaving around the rocks. At low tide, the water recedes almost all the way out of the shallow bay. The rocks and sand exposed like an alien landscape. The ground offering burbles and pops as the water gave way to the air. Rounding out each day was watching the golden sun dip below the horizon, its last rays turning the water shades of oranges, pinks and purples. The sun growing large and red as it moved closer to the water. Sitting on the beach, the peacefulness and beauty was perfect. My attention span doesn’t lend itself to spending multiple days on a beach doing nothing. So after a few days of decompression and hoping to make this blur of a trip slow down, I headed out to see the island. Heading to the little village just over from the resort, I rented a motorbike, put some gas in it and off I went. 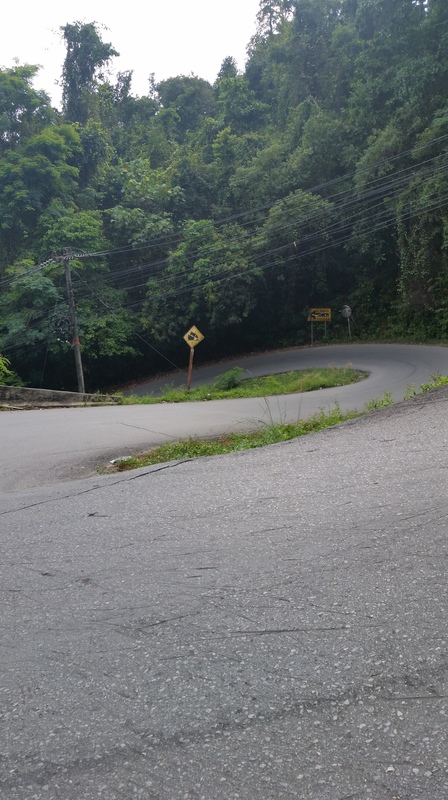 Driving on Koh Chang’s roller coaster roads was a thrill at times. The yellow “steep slope” sign, displaying a truck over a 30-60-90 triangle representing the slope, didn’t seem to do the steepness justice. Going down several of the hills, my toes were pressed firmly against the front of the motorbike foot area to keep me on the seat. Conversely, going up the hills, occasionally it felt as though I might slip right off the back causing me to grasp the handlebars as tightly as possible. The ups and downs are punctuated by sharply twisting turns. One particular hairpin turn between Bailan Bay and Lonely Beach has a double hairpin turn. A sign at the top informs drivers heading down the hill to give opposing traffic the right of way, since it is pretty much impossible to stay in the lane and make the curve. Loving the freedom and feel of riding a motorbike, I have been known to go long distances. To get the feel of the motorbike and hoping for less steep hills and sharp curves, I headed about 10 km south to the southwest point of the island. Or, at least to the point where the road seemed to end. Turning around, I zipped my way north 25 km along the coast, up and down hills, around curves, feeling more comfortable with the motorbike. Along the way I stopped at overlooks, the tops of hills, to see a gathering of cute but really evil macaques, and to visit a shrine or two. Proceeding down the east coast, I found much flatter roads as I rolled through groves of coconut, lychee and rubber trees. Occasionally the fruity floral scent of plumeria blooms would catch my nose. 25 km later, I reached the end of the road at the southeastern point of the island. By the time I returned to my hotel, I had managed to ride about 100 km, all on an island. I wouldn’t have thought it possible to ride that far on an island, yet, I somehow managed to do it. Driving 100 km requires several liters of gasoline. 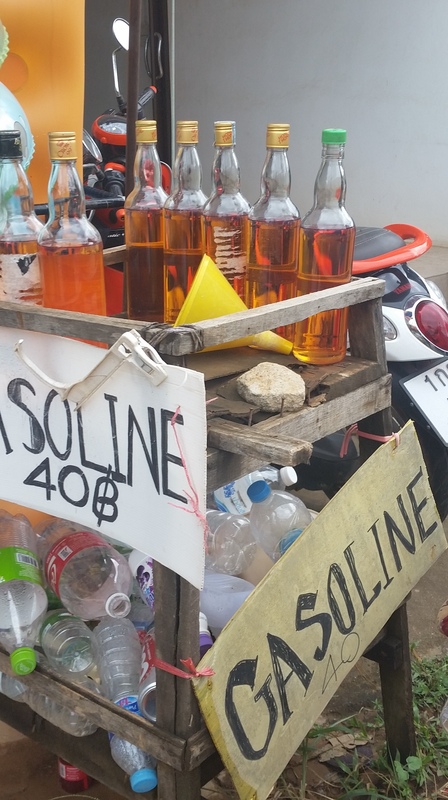 Gasoline “stations” on the island typically consist of several recycled Hong Thong (a whiskey drink) or liter soda bottles filled with gasoline on some type of stand or table with a sign that usually had “gasoline” spelled correctly. The typical cost was about 40 baht ($1.30) for about 750 mL. Coincidentally, the color of 91 octane gasoline and Hong Thong are about the same color. I don’t recommend confusing the two. Stump tailed macaques are indigenous to Koh Chang. Macaques may be cute to look at, they are generally quite mean. At one point, as I came around a corner, a bevy of tourists were gathered gawking and photographing a gaggle of stump tailed macaques putting on a show by the side of the road. I stopped for a picture or two as well; however, I didn’t stay long. As I was looking eye to eye with a macaque, I got the sense he was working through the options of pouncing on me or not. I made the decision for him and sped away. Within the virgin rain forest on Koh Chang are several waterfalls. At 20 meters, Klong Plu Waterfall is the tallest waterfall on the island and is easily accessible from the main road on the west side of the island. 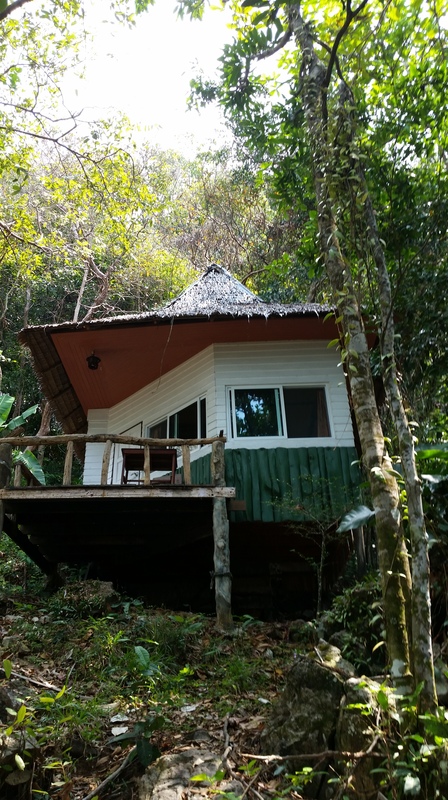 Listed as one of the “Top 16 Things to do on Koh Chang” on Trip Advisor, even in dry season, I opted to pay the 200 baht fee for foreigners and hiked to the waterfall. After paying 10 baht to park my motorbike at the insistence of the friendly locals to park outside the gate, I discovered free parking just inside the gate. The trail leads through the rain forest to the waterfall. Having had some rain the two days prior, the ground and trees were moist and everything was lush green. At the end of the trail, the area opens out into a vista with a terrific view of the cascading waterfall. As a popular spot to visit, I was not alone. 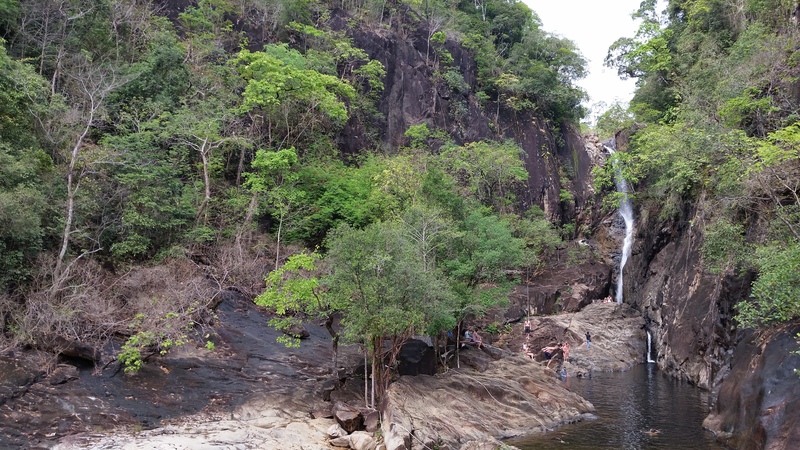 Many tourists and Thai were wading or swimming in the water, jumping off the rock face into the deep swimming hole at the base of the waterfall. Escaping some of the tourists by scrambling over the rocks, I was able to get a closer and more peaceful view. And as the Trip Advisor review indicated, even in February it was worth the time to go visit. Kai Bae View Point is purported to be the most spectacular spot to view the sunset on the island and at every tourist shop you can find postcards taken at this spot. On a cloudy day it is a nice view. On a clear day it is an absolutely gorgeous view. The first time I stopped at the view point, it was overcast. Two days later the weather was clear and sunny. Despite gut wrenching cramps from food poisoning, I ventured around the double hairpin curve to go to the view point. Looking out over the turquoise and aqua water glistening in the sun and the smaller green islands, I was reminded of how beautiful the place the island is and how fortunate I am to get to take these adventures. For those of you that have been following my tales since the beginning, you might recount my first experience driving a motorbike on a Thai island and the resulting “Phuket tattoo” (burn) from a small mishap that I had. In the past almost exactly 7 years, my motorbike skills have improved dramatically. Probably helps that I only use automatic motorbikes at this point. Three days of riding on the steep roller coaster hills with their hairpin turns and no mishaps to report. Phew. The trip leaving Koh Chang for Bangkok was much less harrowing than the trip getting to Koh Chang. Svuarnabhumi (prounounced: soo-wan-a-poom) Bus Company offers a trip from Koh Chang island directly to the Svuarnabhumi airport for 600 baht ($20). Staying at the resort farthest down the coast, I was the first to be picked up by the minivan on the morning of my departure. We made our way back up the coast, stopping at several resorts along the way until the van was filled with other tourists starting their journey onward. From there, they gave us white tickets and took us to the center point ferry. Dropping us off with our luggage, we were herded onto the waiting ferry and directed to go ahead and leave our bags gathered along the side with the cars, and head upstairs. Weather beaten and rusty from the salt water and sun from the hundreds of trips back and forth, the ferry churned through the water, leaving Koh Chang behind and heading for the mainland. The weather was beautiful, giving me one last fill of turquoise water and lush green island. Taking a few more pictures, I said goodbye to Koh Chang. Arriving at the dock on the mainland, I watched in awe at the skill of the ferry pilot in bringing the ferry into dock. With incredible precision and timing he swung the ferry around and docked it seamlessly. Gathering our luggage and watching the finely orchestrated dance of cars being directed off the ferry, we made our way to a shuttle bus. This bus took us the length of the pier. Unloading and gathering bags one more time, we transferred to the big bus to go to Bangkok. I managed to snag a window seat. Lena, a nurse from Sweden, asked to sit by me. Much to the probable chagrin of the passengers around us, Lena and I hit it off splendidly. We talked pretty much the entire 7 hour bus ride, including the stop for food that the bus makes half way to Bangkok. As though breaking my computer and camera on this trip weren’t enough, I managed to finish the trip with a flourish. Arriving in Svuarnabhumi airport, I said my goodbyes to Lena and went to 7-11 to get some juice and yogurt for the morning. As I went to pay for my purchase, I discovered that my change purse was not to be found in my bag. Filled with panic, I paid for my purchase with other money that I had, scurried out of the shop to the nearest place I could and dumped the contents of my bag on the floor to make sure I didn’t just miss it. For some reason, when something is misplaced I think it is human nature to check in even the most unlikeliest of places. I checked my backpack, which I hadn’t opened on the bus or since being in the airport, and my bag a third and fourth time. No luck. Rushing down to the bus counter, I asked if the bus was still there. No, it had already left to go over to the main bus terminal for cleaning. Pearl, a Thai woman who happened to be standing there, was a wonderful help. She made phone calls for me and wrote out my situation in Thai to make it easier for me to communicate with the people at the main bus terminal. Anxious and hopeful, I got on the shuttle to the bus terminal. I kept telling myself “jai yen yen” (which means to keep a cool heart and not get excited) but I wasn’t listening very well. They pointed me to the bus and despite it already being swept and half mopped, they still let me look under and around my seat. No luck. While upsetting and annoying, nothing that was in the change purse is irreplaceable. I’m grateful that I still had my passport and I had money to travel. Arriving at my hotel, I called and cancelled my credit card that was in the purse and when I return home, I will get a new drivers license. These are the events that make a journey and adventure.